Fender Acoustasonic Tele Guitars - Andertons Music Co.
An electric / acoustic guitar hybrid built with the modern musician in mind! The Fender Acoustasonic Tele pushes the boundaries of guitar design - essentially an electric/acoustic hybrid guitar, it's been built for modern musicians looking for the ultimate expressive tool. The Acoustasonic is based on the classic Tele shape, but that's where the familiarity ends. Almost every other aspect of this unique guitar goes against Fender's grain. 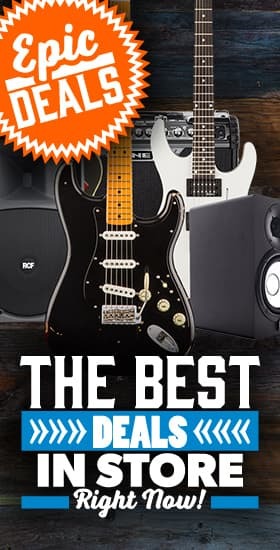 Powered by a revolutionary Fender and Fishman-designed acoustic engine, this instrument allows you to effortlessly change from convincing acoustic sounds to traditional electric rhythm tones on-the-fly. A totally hollow Mahogany body offers rich lows and a bell-like mid-range. In addition, Fender's 'Stringed Instrument Resonance System' (SIRS) helps the Acoustasonic achieve the response and harmonic breadth of an acoustic guitar. A Mahogany neck and sleek Ebony fretboard complete tonewood combo - the result is stellar playability and a sound quite unlike anything else.